I am especially delighted to write in honor of the icon Aga Khan. His projects for humanity are innumerable. Health, education, religion, and poverty are the main of his interest. All of Aga Khan organizations are based on transparence, independence, responsibility, and nonprofit. Through his future vision to create a coherent system in the world, he received many awards from different countries. In addition, his way of explaining the fundamental message of the religion made him a real leadership of the Muslims in the world. The Aga Khan was and continues to be concerned about the unhealthy state of education and science in the developing world. Face this reality, 300 schools has been created in Asia and Africa, which constitutes an educational institutions very powerful (1). This environment provides quality preschool, primary, secondary, and higher secondary education services to students. Created by his highness, the schools are installed in the village of Africa, which have a priority of development. This ability to change this environment has had a great reflection to change the mentality of work of people and press them to create and innovate. This contribution inspired by Islam aims to achieve the ethical vision of society and eliminate the ignorance that remains the real obstacle to advance humanity. In addition, the cultural and economic impact is enormous. In his speech, the Imamat emphasized the education for all children irrespective of religion, ethnicity or gender. The environment invented by the polymath Aga Khan seeks to strengthen the role of the private sector include health, tourism, and industry. His Highness thinks that the creation of isolated schools hasn’t reached the pinnacle of a strong educational system. For this reason, he initiated the academies that represent a network between schools. This philosophy of Academies has a magical effect on the behavior of the student. Working in a connected environment and linked to a real problem of the life allows student to make a difference. The conviction of the thinker Aga Khan beyond the construction of environments for education, but also to equip them with a high level of technology that allows students to be at the same level and skills compared to other students in the world. This responsibility of thought did not forget the role of the daughter and wife in the Aga khan system. In 1966, His highness claimed that ”There was no school building. And, there was little enthusiasm for educating girls” (2). The leader Aga Khan is not limited to the thought, but also the application of his ideas. This requires a patience, work and strategies for change for the better. To establish an excellent schools, Aga Khan Academies have sought, wherever possible, to create a dynamic environment with cultural, sports, and moral activities. The pioneer Aga Khan put all the means to bring technology and laboratory in a challenging environment of point of view geographical and cultural in Africa and Asia. Aga Khan foundation support this noble work with donation, conferences, and collaboration. 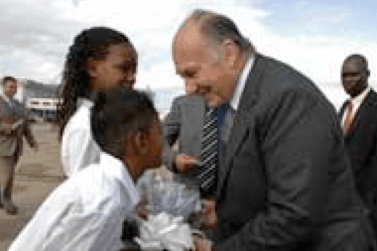 The headman Aga Khan thinks that many problems can solved by science and education, especially health. Safe childbirth and sample diseases may lead to loss of life. The call of duty leads the chief Aga Khan to collaborate with governments to ameliorate a health state. For example, a staff of surgeons and doctors are sent to Afghanistan for the improvement of nutrition and reduction of some diseases for mothers and children. Researchers and scientists take advantage of this excellent regime. Aga Khan University Medical College has a high quality program of master and PhD for residency training. Research at the Medical College encompasses many specialties that affects real life problems such as diarrhea and tuberculosis. This fruit of the practice and research have created an atmosphere of extraordinary work in countries that experienced difficult political conditions. Really, his highness is a man who loves a challenge. Culture and civilization has a part of his human project which have a thorough goals. The Aga Khan Trust for Culture (3) is an example of a beacon to improve the welfare and prospects of people in countries. The ringleader Aga Khan is not limited to, his team, which includes the board of directors, board of trustee, collaborators, but his vision affects the professionalism. His highness encourages the young not educate to educate, but educate to create. For that purpose, The Aga Khan Award for Architecture (4) remains an example to promote the mentality of work to students. To conclude, Aga Khan’s vision has many dimensions that formed a leadership in looking for a better world. His message to humanity is clear: how can build bridges between nations with knowledge? His legacy will remain vivid in the pantheon of history. (1) Excellence in education. The Aga Khan Academies 2003. (2) Aga Khan Foundation team. Non-State Providers and Public-Private-Community Partnerships in Education – Contributions towards Achieving EFA: A Critical Review of Challenges, Opportunities and Issues. Paper commissioned for the EFA Global Monitoring Report. 2008. (4) Lewcock, Ronald. “The Aga Khan Program for Islamic Architecture at Harvard University and the Massachusetts Institute of Technology”. In Architectural Education in the Islamic World, edited by Ahmet Evin. Singapore: Concept Media/Aga Khan Award for Architecture, 1986.